This week we’re not looking at an individual mule, but rather at a whole bunch of mules who live the most fantastic life together in Belgium! 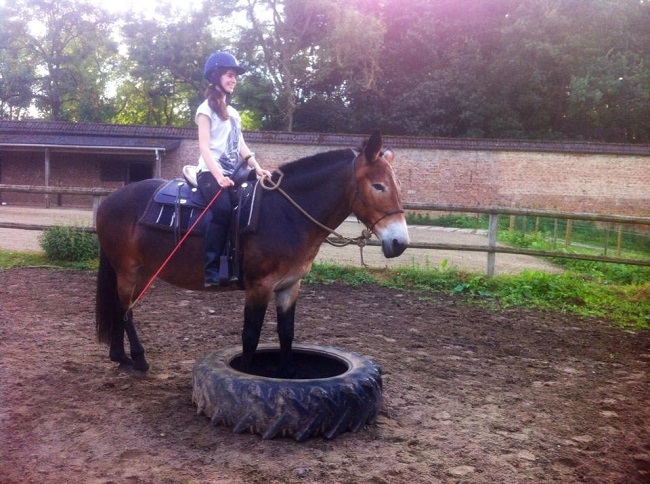 Le continent des Mules is a riding school with a difference. Not only are the majority of its inhabitants mules or hinnies – all of whom have been rescued! 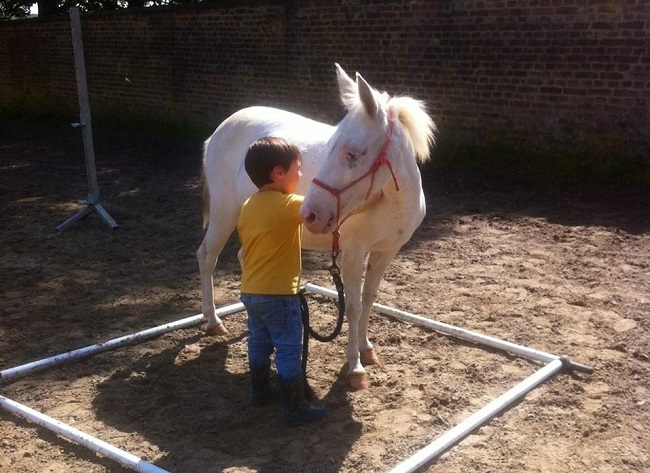 – but it focuses on teaching children how to form partnerships with their steeds based on mutual trust and respect. I think this is absolutely wonderful and am thrilled to introduce them to you. All photos are copyright © Le continent des Mules. 1. Please tell us about what you do! So what I am doing (in my best English that I have learned by myself so not very good 😊): I am trying to create a project that began a long time ago in my head. 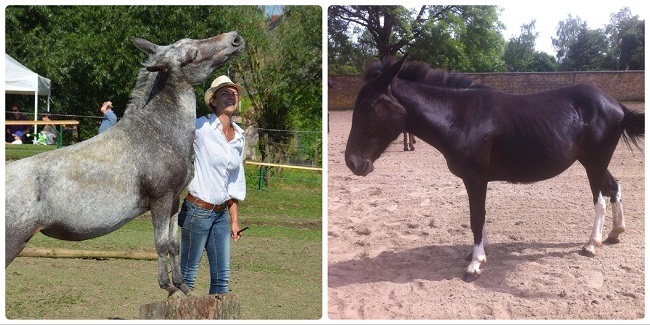 Create a mule barn in Belgium, and let people meet them here. Then working with small mules and hinnies in natural horsemanship and hippotherapy, which four of the mules have practiced for one year already. Then I am also passionate about saving mules and have rescued almost all of the herd from slaughter or from people who couldn’t handle them. This amazing hybrid is not well known in our country so they often die in slaughterhouses or get used at the veterinary schools for euthanasia training. So, in short, I have saved mules because I love them, and I will make a place where they and people can meet together and discover the hybrid in a herd at liberty. I am also working with children and adults who are in trouble mentally and physically. But also I enjoy starting mules and developing them so that they can show me what their preferred discipline will be. 2. Why did you choose mules and hinnies, rather than horses? I choose them because they are high spirited 😊 , more challenging to convince at the beginning but more balanced in their mind. They are more friendly and I prefer an animal who wants to be with humans. 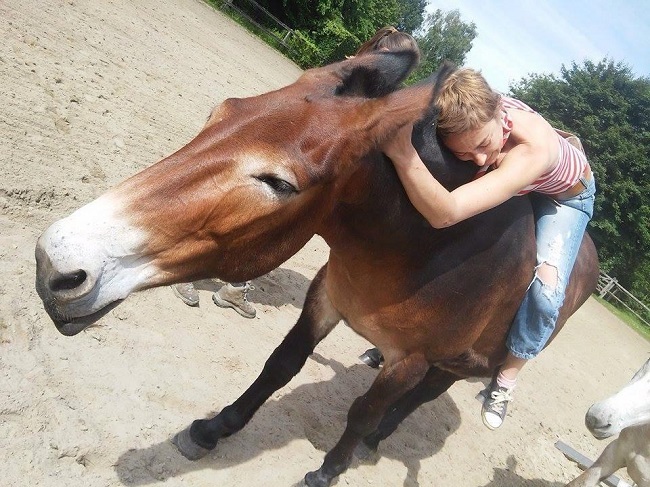 They are less sensitive to our fear and a mule has his own thoughts about what is happening, analyzing the situation, thinking before they run … and such fun animals, they play all the time!!! They like to play together and with us more than a horse would. 3. How many mules and hinnies do you have? Do you have a favourite? I have 4 hinnies, 5 mules and 5 of them are unknown breed. My favorite is Twiggy mule, and Vannille hinny. Twiggy is the first mule I met … she was a good teacher for me, she was terribly difficult to touch but when she decided to be my friend it was like she was my dog, trotting to be with me all the time and she taught me to respect her and to understand what a mule is. She is a master for me … high energy, high potential … and I have a lot of fun with her too. Vannille is young, she is two years old but she acts like a very mature animal; calm, polite, with a playfully special way of coming to say hello. I feel something special in my heart I can’t explain. She is the baby here and she is more mature than anyone, curious and calm – opposite character of Twiggy. But I have to admit that I love them all! 4. Can you tell us about an occasion that made you smile? I am smiling every single day with the herd … they are so amazing. 5. What advice would you give someone who is new to mules? Some advice … well, just be sure that you are ready to be scanned by your mule. Be ready to stay humble and to be polite. When you ask for something, they think faster than you and they are smarter than you. Be ready to have a lot of “NO! I will not do that if you don’t wait for me to understand and figure out what you want … I will do it if I am able, if I feel good, and if I have some interest too”. 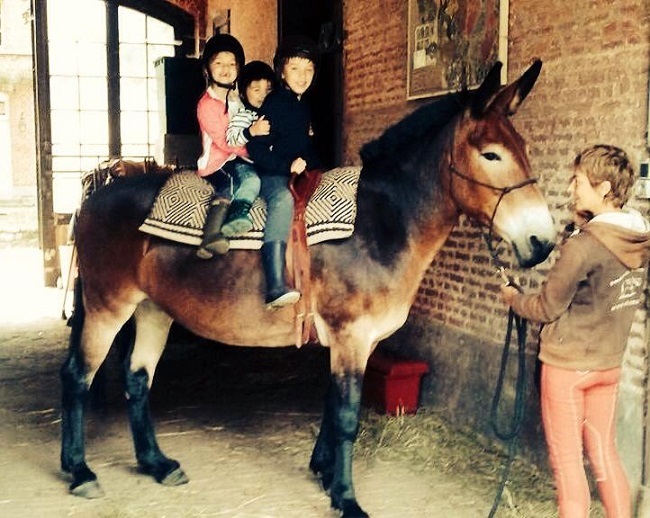 That’s why I am more about educating children than just letting them ride … for children, the mules are the best teacher for them to learn some respect of animals.